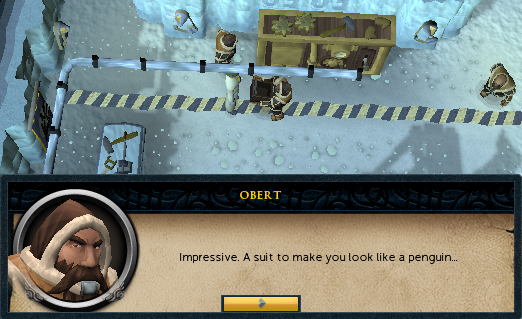 Speak to Larry at the Ardougne Zoo. 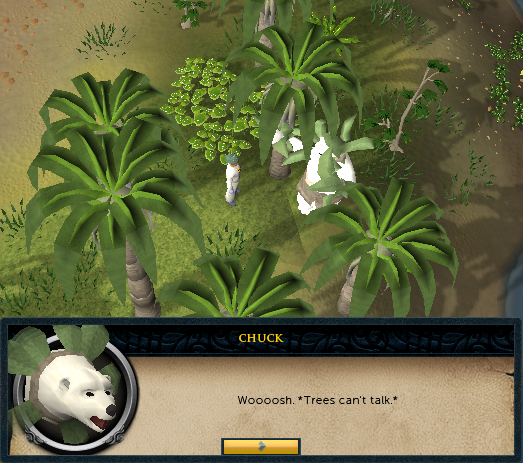 Start off by speaking to Larry in the southwestern part of Ardougne Zoo. He talks about how the penguins are beginning their invasion, and promises he'll explain everything if you help him. 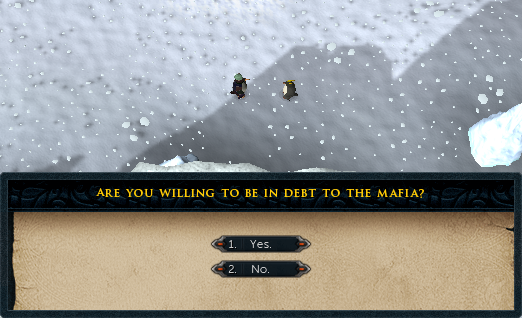 Say yes, and he'll tell you he's seen a giant penguin at the coast of Witchaven! You tell Larry you'll go investigate over at Witchaven, but before you go, you give him a little scratch on the nose. Go east of Ardougne to reach Witchaven. In the southwestern part you'll notice a giant footprint. When you get to it, inspect it. Turns out Larry isn't crazy after all. Now go back to Larry and tell him about the giant footprint. Once you go to inform Larry of your find, a zookeeper will attempt to put him into a cage. After trying to persuade the zookeeper, you and Larry show him the giant footprint to prove Larry's sanity. After that, the Zookeeper frees Larry from his straitjacket. Larry then tells you to meet him at the iceberg. To get there take a boat from the docks east of Rellekka. He also says to bring your penguin suit, and if you don't have it anymore he will give you a book that tells you how to make it. Once you get to Rellekka (walk or use the lodestone) head east around Rellekka where the rock crabs are and get on the boat. 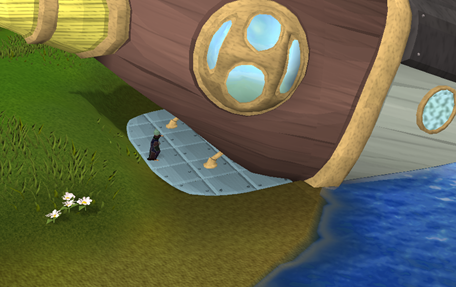 Another way you can get to the Iceberg is to use the Fairy Ring code "DKS" and walk to the boat. Once you're at the iceberg, Larry tells you he needs to know how to find the submarine, how to get on the submarine, and how to disable the submarine. Go northwest and enter the avalanche. Head through the second door on the left and talk to the KGP Interrogator. For this part, you have to interrogate the suspect. You will have 5 things to interrogate the penguin about. In each of them you have things you can say. For the statement: "My Captain trusted me to deliver the message"; you should reply "Your captain must trust you a great deal." For the statement: "My captain found a greater leader"; you should reply "What leader could possibly be greater than the Pescaling?" Then reply with "The sea may control your Captain, but he controls your life." For the statement: "He will bring unity by destroying the humans"; you should reply "Why not unite all penguins to The Sea, first?" Afterward, choose the statement: "He's only demonstrating his impatience." For the statement: "Nothing can stop him"; you should reply "If he comes to rescue you, he'll be captured." For the statement: "Our sacrifice will be remembered. "; you should reply "'Our sacrifice'? Only you appear to be making the sacrifice." After all that he'll crack and tell you how to enter the submarine. You'll need to call the submarine to the surface with a Conch Shell, then do a dance that signals you are a friend. 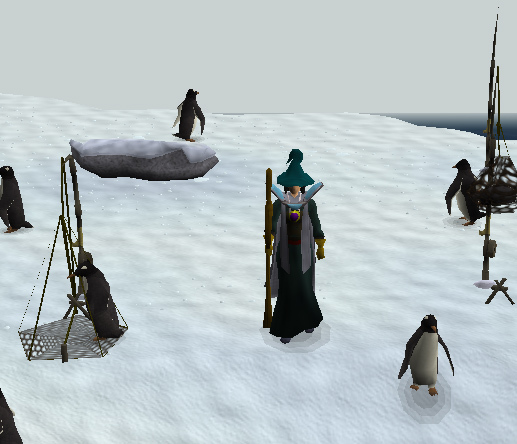 The penguin prisoner will tell you the sequence of emotes for the dance; since this is random for each player, it's recommended to write them down. You'll also need to wear a fish on your head to disguise yourself as the prisoner. The needed headgear is different for each person: either the Puffer, Octopus, Monkfish, or the Ray. Take note of which one the prisoner is wearing. 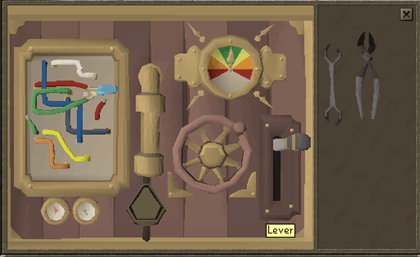 To get the Conch Shell and the fish headgear, search the crate that has the interrogated penguin's belongings. You'll find the shell and all of the fish; make sure to keep the one that matches the prisoner. All 4 fish can be kept to wear after the quest, if you like wearing costumes. Go all the way to the north and try opening the large double doors; the guard won't let you. Head over to Ping and Pong, who are behind the 4th door on the right. They tell you they'll help you make a song to make the guard go to sleep, but you need to find out some things about the guard first. Go back to him and talk to him. The guard's routine to help him sleep is to drink some warm cocoa, kiss his chicklings good night, and wrap his feathers in a green blanket. Replace the word "something" with "chicklings"
Replace the word "things" with "squirrels"
Replace the word "something" with "green"
Replace the word "things" with "bears"
Replace the word "something" with "kiss"
Replace the word "they" with "bears"
Note: This is just one of the possible lullabies. Different combinations are possible. If you did it correctly, the guard will fall fast asleep. Once he's asleep, go and operate the control panel, and the doors to the war room will open. Head to the eastern room. 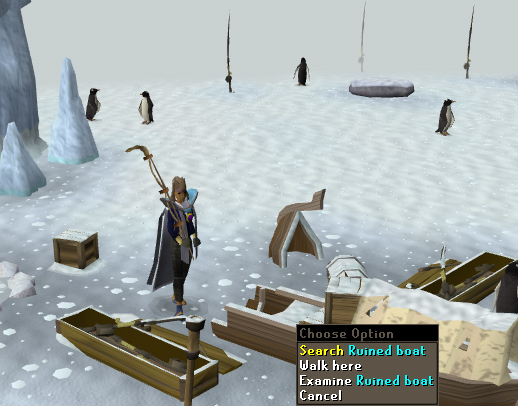 Apparently the penguins have the dwarves making a giant penguin for them! 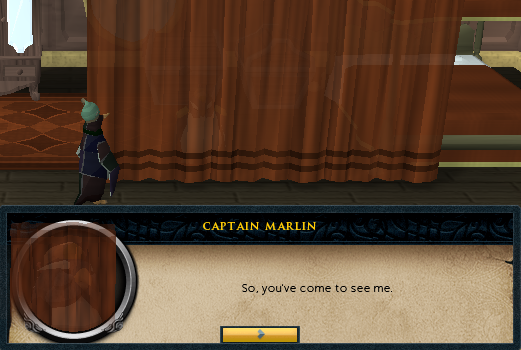 Talk to one of the dwarves and he'll tell you he has nothing to say to you penguins. You tell him you're a spy, but he doesn't believe you; so you'll have to prove it. Take off the suit. The dwarf says they've been kidnapped, and are being forced to work for the penguins. 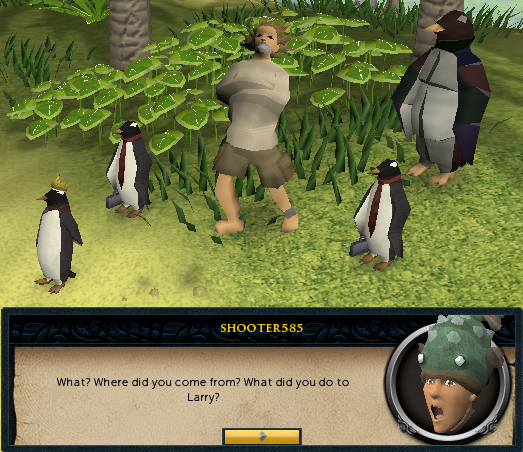 After talking to the dwarf, leave the room; you'll be knocked out by a penguin and end up near Larry. Talk to him and he'll tell you his penguin magic won't work on them from so far away, but you can give them the supplies to make penguin suits that they can wear. 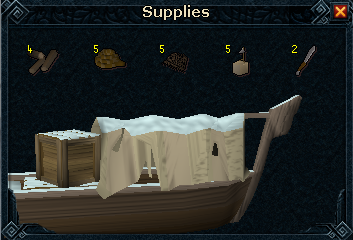 So now you'll need 8 silk, 4 planks, 1 needle, and 1 thread. Once you get all that, go back to the dwarves and give it to them. 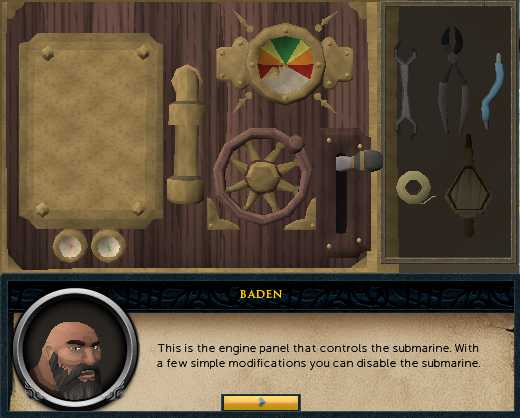 The dwarf will hand you a toolbox which contains the tools to disable the submarine. Use the wrench to open the wire box cover. Cut the green and red wires with the wire cutters. This will cut off the command room from the engine. Use the spare wire to rewire the green wire to the red wire. Now you've re-routed control to the engine room. Wrap the tape around the raw ends. Pump the air into the pipes until it's getting near red. The submarine will need some air pressure to maneuver to your new destination. Turn the wheel, but watch the gauge. Stop once it's green - the arrow will point straight up. If you don't stop, you'll have to pump with the bellows again. Pull the lever, and the submarine will start on its new course. Just sit back and the sub will do the rest. If you do it all correctly it should look like the picture above. Now leave the room to get knocked out by a penguin and end up by Larry. Give him an update on what you've done. Larry suggests you speak to Noodle, who can be found right by the avalanche. Looks like if you do this, you're going to be in debt to the mafia! Noodle tells you there's a room full of cubes with penguins wandering around. They keep the info in the back-right room. He can get you an ID to get in, but you can't cross the paths of the penguins. Noodle hands you an ID card. Follow the above path, staying out of the penguins' line of sight by hiding behind walls and columns, and waiting for them to move away from you before crossing open areas. If you are caught, you'll be transported back to the hall and have to start over. 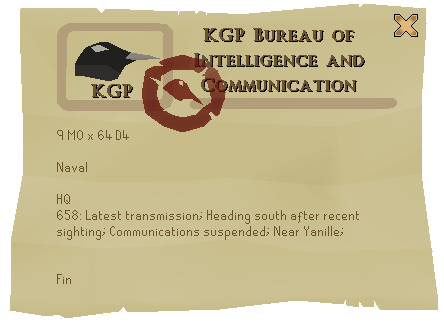 Once you reach the cubicle, search the sorting table, and you'll find a telegram from the KGP Bureau of intelligence and communication. Once you have the telegram in your inventory, leave the area by reversing your path; you still need to avoid being seen. If you get caught you lose the telegram! But no worries, if you start over you'll find that the penguins made plenty of copies. When you reach the hall safely with your telegram, go back to Larry and show it to him. 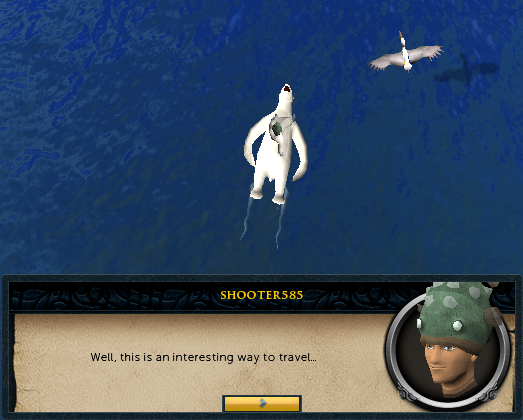 With the Fish Hats, the Toolbox, the Conch Shell, and the Penguin Suit head to Larry who can be found slightly southeast of Yanille. 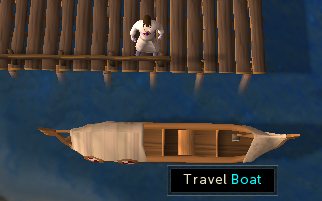 You'll find Larry just outside of Yanille to the southeast. 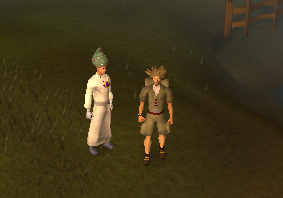 Once he turns you into a penguin put on the hat that the penguin you interrogated had on, then blow the conch shell. Now back when you interrogated the penguin he told you a dance you had to do which consisted of 3 emotes. Do those 3 emotes and you'll gain entrance to the submarine. Once you are in the submarine, talk to one of the penguins and they'll tell you to report to the captain. Climb up the ladder and walk to the last room. Here you'll meet the captain. After a long talk you find out that there's a Sea Slug on the captain's head! The captain will call the guards on you and take your toolbox. Go west and take the items from the hatstand. Now go back east and open the door with your swordfish. Take a look at the engine panel... Looks like we'll have to improvise. Use the crab claw to open the wire box cover. Cut the green and red wire with the shark tooth. Use the eel to rewire the green and red wire, then wrap the seaweed around the raw ends. Use the puffer fish on the pipe, and pump until the arrow on the gauge gets near red. Use the octopus on the wheel to turn it until the arrow is pointing straight up. Use the swordfish on the lever spot, then pull the lever. Once this is done the submarine will take you... somewhere. You come out and Pescaling Pax tells you Larry is gagged! Turns out the dwarves weren't on your side after all, and Pescaling Pax was using you, but wait - it gets better! 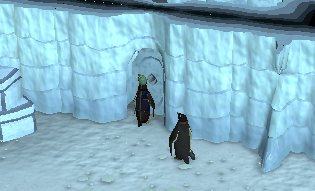 The dwarves have sided with the penguins! Well now you're trapped on the island, and there's a polar bear-like tree. Try talking to it. The bear works for PBJ, which is connected with Larry. He never told you about it for your safety and theirs. Larry is now being held at the "Motherland", but you aren't ready to go there. The bear then swims you off the island. Chuck the Polar Bear is now the new Larry, taking over his post at the zoo. 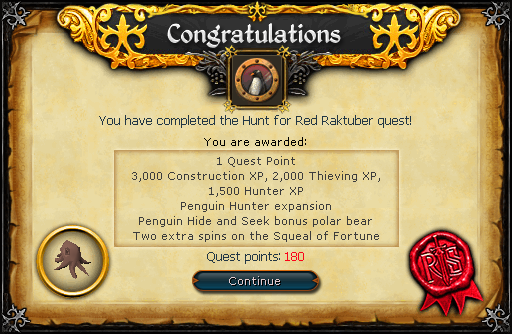 This quest's plot reveals the existence of polar bear agents spying on penguins throughout Gielinor. One of these may be spotted each week alongside the usual ten penguins, as part of the Penguin Hide and Seek Activity, for an extra Penguin Point. Old Fishing Rods, requiring a rope and a small fishing net. The penguins are caught alive and released again with the exception of KGP agents. Have a conversation with Jim, the polar bear, before entering the hunting area, and he will take the KGP agents. All penguins give 250xp when trapped with a further 2xp per captured KGP agent, when they are passed onto Jim. 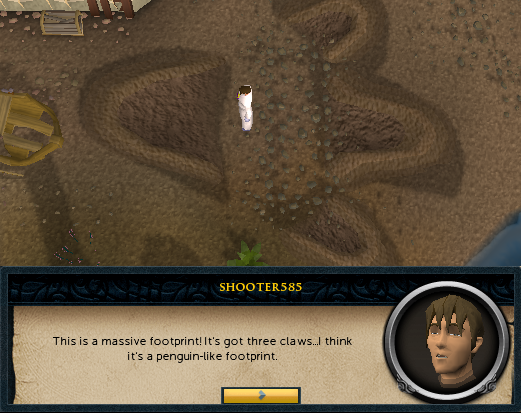 [^] Go to Witchhaven and search the footprint. [^] Travel on the boat north-east of Rellekka. [^] Speak to the KGP Interrogator. [^] Talk to Ping and Pong. [^] Talk to Guard and return to Ping and Pong. [^] Sing Lullaby and talk to Dwarf. [^] Exit base and return to Dwarves. [^] Talk to Larry and Noodle. [^] Navigate maze room and search table. [^] Talk to Larry and go to Yanille. [^] Blow shell and perform dance. [^] Speak to the leader. [^] Talk to the Tree.